Thoughts on the New Year: Keep Thinking BIG, MedTech Strategists! As the MedTech world begins a fresh new year of innovation and opportunity, the In MedTech History series would like to take a moment to thank you—the uber-industrious global community of MedTech Strategists—for your achievements. Over the past 6+ months on these pages, we’ve looked back at many cutting-edge medical device innovations that had their humble beginnings many years or centuries ago, many as curious discoveries or experiments. Through trial and error over time, inventions brought to life by passionate innovators from around the globe—such as X-rays, neurostimulators, insulin pumps, and intraocular lenses, to name a few—have left an indelible mark on patient care and quality of life. It is awe-inspiring to contemplate this hard-fought evolution, and the life-changing discoveries that haven’t even been dreamt of yet. So to all of you passionate innovators, keep thinking BIG. We are proud to follow your dreams and journeys here on the MedTech Strategist Community Blog. With these thoughts as a backdrop, this week In MedTech History we take a look at a technology originally devised from tin cans and washing machine parts that now is a life-saving therapy for many thousands of kidney failure patients: dialysis. More than 500,000 US kidney failure/end-stage renal disease (ESRD) patients are currently being treated with hemodialysis several times each week in order to survive, according to the latest estimates from the US Renal Data System Annual Data Report. The incidence of ESRD is rising in the US by 5% per year, and treatment is a little known but dominant cost driver for the healthcare system. Those who live with ESRD represent 1% of the US Medicare population, but account for 7% of the Medicare budget. The annual cost to treat kidney failure patients with dialysis in the US is a staggering $42 billion—or an average of about $90,000 per patient per year. What’s more, chronic kidney disease is a worldwide health crisis. An estimated 3.4 million people worldwide currently receive dialysis, with this number estimated to reach 5 million by 2025, according to Fresenius Medical Care, the largest global provider of dialysis services. And yet, these numbers represent only a fraction of those who actually need such treatment to live. In the 1940s, Dutch physician Willem J. Kolff, now regarded as one of the most important physicians of the 20th century, became interested in finding a treatment for acute renal failure while taking care of World War II casualties in the Netherlands, at the height of German occupation. He theorized that if a machine could replace the failing kidney for a few days to weeks, filtering out acid and waste materials from the blood, then the kidney tissue could regenerate and function again. 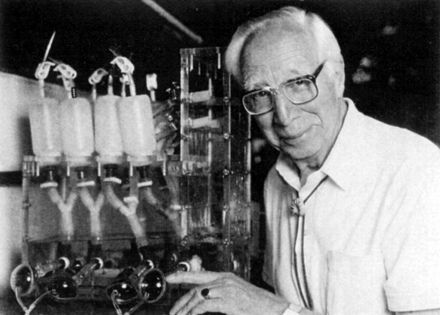 In 1943, he built the first dialysis prototype using tin cans, sausage casings, and parts from washing machines and other scarce available resources. Although his first few attempts were failures, Kolff eventually did create a workable device, that for the first time offered an effective intervention for the treatment of acute renal failure. After the war, he donated his inventions to other institutions in Europe and the US to spread familiarity with the technology. One of his machines, sent to Mount Sinai Hospital in New York, was used to perform the first US dialysis on January 26, 1948, under the supervision of Drs. Alfred P. Fishman and Irving Kroop. A patient is dialyzed using one of Kolff’s first rotating drum artificial kidneys. In 1950, Kolff left the Netherlands to seek opportunities in the US. At the Cleveland Clinic, he was involved in the development of heart-lung machines to maintain heart and pulmonary function during cardiac surgery, and he also improved on his dialysis machine. At Brigham and Women's Hospital, with funding from New York real estate developer and medical device philanthropist David Rose, Kolff developed the first artificial kidney, the Kolff Brigham Artificial Kidney, manufactured by the Edward A. Olson Co. in Boston. Later he developed the Travenol Twin-Coil Artificial Kidney. Later, at the University of Utah, Dr. Kolff mentored Dr. Robert Jarvik, and together they created the Jarvik-7 artificial heart. Thanks to the pioneering work of Dr. Kolff and those who followed in his footsteps, dialysis has saved millions of lives. However, this decades-old technology is in need of innovation in order to improve less-than-optimal patient outcomes, improve quality of life, and lower the steep—and growing—costs associated with long-term treatment. Hemodialysis today is fraught with morbidity and eventual mortality; only 35% of patients remain alive after five years of treatment, according to University of California San Francisco’s The Kidney Project statistics. 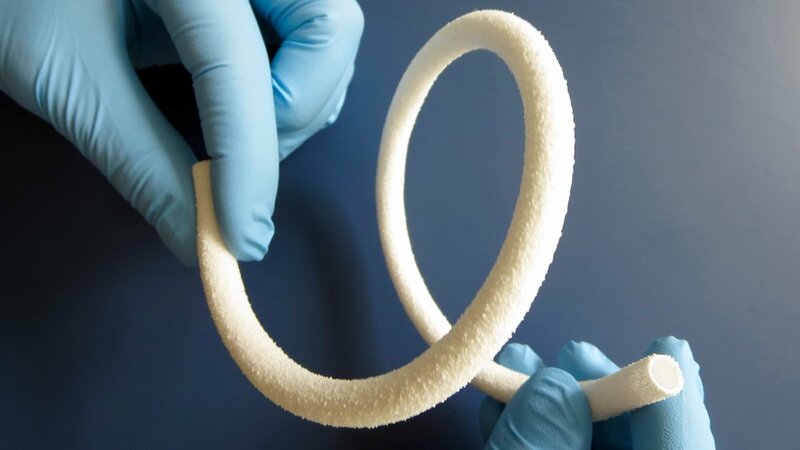 Seattle, WA-based medtech company, Healionics Corp. has developed a novel synthetic vascular graft to address the most critical and costly unmet need in dialysis, which is maintaining healthy and functional access to the bloodstream. Dialysis patients often need multiple surgeries and undergo treatment for frequent access site complications such as infections and blood clots. The Community Blog caught up recently with company CEO and Chairman Mike Connolly, a 28-year device industry veteran who is passionate about providing a better option and improved quality of life for these patients. For a bit of background, access for hemodialysis (as opposed to less-frequently-used peritoneal dialysis which is performed via an abdominal catheter), is usually performed via three methods, all of which have serious problems, says Connolly. The most common method for patients with adequate vein strength and size is through an arteriovenous (AV) fistula, an access site formed by the surgical joining of a vein and an artery in the arm. However, the fistula takes months to mature before it can be used for dialysis and frequently fails to mature at all, necessitating additional surgery. The second most common access method is via a synthetic vascular graft, an artificial shunt that connects a vein and artery in the arm. These grafts, typically made of an expanded Teflon material, are prone to frequent occlusion which requires repeated expensive interventions. And every intervention or surgery comes with added risk for ESRD patients, since most of them are immune system-compromised. Most US patients start by receiving temporary dialysis through a third method: a central catheter placed through the chest into a large vein that leads directly to the heart. This high-risk access method is the most prone to serious complications, including infection and death. “The current access options all have severe drawbacks, and patients and physicians are eager for improved solutions,” says Connolly. Healionics’ proprietary Sphere Templated Angiogenic Regeneration (STAR) biomaterial (pictured at left) has demonstrated substantial benefits in a variety of implant applications due to its unique ability to prevent both scarring and infection. Using this platform biomaterial, Healionics developed a synthetic vascular graft, STARgraft (pictured below) which has demonstrated superior patency and resistance to occlusion in multiple preclinical studies. The company is focused on addressing the urgent need for improved vascular access in hemodialysis patients, with its first human study of STARgraft beginning early this year. Subsequent applications for STARgraft include peripheral artery disease, says Connolly. Connolly further explained that there are a number of synthetic vascular grafts on the market, but none have addressed the most common cause of graft failure, i.e. occlusion. Healionics, which presented at our MedTech Strategist Innovation Summit this past November in San Francisco, is also developing a device to enable needle-free hemodialysis, called the STARport. This easy-to-use implanted port could help spur the movement to more convenient home-based dialysis, says Connolly, which offers better quality of life and potentially improved health outcomes as well. Healionics has received multiple grants from NIH and DoD in support of its development of STARgraft. The company is currently raising funds to bring the device through its first human trial. Its platform STAR biomaterial is already in human use as an implant for reducing intraocular pressure (IOP) in glaucoma patients, through its Belgium-based spinout founded in 2011, iSTAR Medical SA. In the upcoming Part 2 of this post, we talk to Laminate Medical Technologies’ CEO Tammy Gilon about the company’s VasQ blood vessel support device for patients receiving dialysis. In addition, we take a look at broader industry efforts to foster innovation in this space, including the Kidney Innovation Accelerator (KidneyX), a public-private partnership between the US Department of Health and Human Services and the American Society of Nephrology.